With Assimil, learning French has never been so accessible: its method of intuitive assimilation has allowed millions of users to learn a new language. 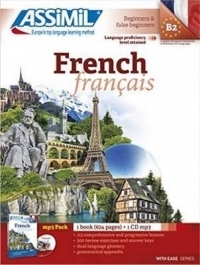 Whether you're a total beginner or just want to brush up on your French, the 113 lessons with their lively dialogues, simple notes and practical exercises will allow you to soak up the language naturally and progressively. By studying 30-40 minutes a day, in just a few months you'll be able to converse comfortably in French in a variety of everyday or professional situations. Pack includes book and 1 MP3 CD.